Buy Casual a coffee. ko-fi.com/casualdhole - Ko-fi ❤️ Where creators get paid by fans, with a 'Buy Me a Coffee' button. 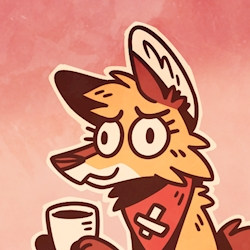 You spot a doofy dhole quietly sipping a cup of coffee at the corner table of a local outdoor cafe. Seems like a rather humdrum sort of scene until you notice the rather large mountain of empty mugs behind it. "Coffee ? What coffee ? You mean this pile of what used to be delicious-delicious-caffeinated-liquid-rainbow-beverages-of-wonder-roastedbeans NO I DON'T THINK I HaVE ENoUGhyET SHUTYOUR PANCAKEFLAPS !" Secured Payments. Support goes to Casual's account. Upgrade Casual to a yearly Gold Membership with a one-time payment.